The Striking Corner’s very own photographer, Victor Alvarez was on hand at Glory 37’s first card of 2017, which took place on Friday, January 20th, 2017 in Los Angeles. As with every Glory event, the night was full of fast paced action, some upsets, some surprises, and a little controversy. But overall Glory’s first show of 2017 was solid with great matchups such as Matt Embree vs. Robin Van Rossmalen and the Glory Middleweight title fight between Jason Wilnis and rising star, Israel Adesanya. Check out the great images form our photographer Victor Alvarez in the slideshow below. I am a huge fan of film, photography, and pretty much all sorts of digital media. Whether it’s graphic design, motion graphics, or web design, I am always looking at things from a design perspective. When I am not posting things for The Striking Corner or in the studio getting ready to record another episode of our podcast, I am at my day job working as a Digital Content Manager for a major broadcasting company here in the U.S. Everyday, I see talented videographers, producers, photographers, designers, DJ’s, radio personalities, hone their craft and share it with the world. It is for this reason that I have a soft spot for all of the creative artists that are involved in the sport of Muay Thai and Kickboxing and use their talents to showcase how beautiful the martial arts are. A fight is a masterpiece in motion. To the untrained eye it simply looks like a “fight”. But to the trained eye it is a chess match, a warlike game full of strategy, misdirection, defensive tactics, timing, counter attacks, and full on all out assault when necessary. The creative minds that are in our sport, and I take this moment to drop names of awesome photographers in the sport like: Jeff Dojillo, Galen Okazaki, Ahren Nuang, Marty Rockatansky, Scott Hirano, Stever Ferdman a.k.a. Bauzen, Arnold “Marz” Marzan, and of course our very own Victor Alvarez; can take what seems like a brutal sport and turn it into a visual symphony. 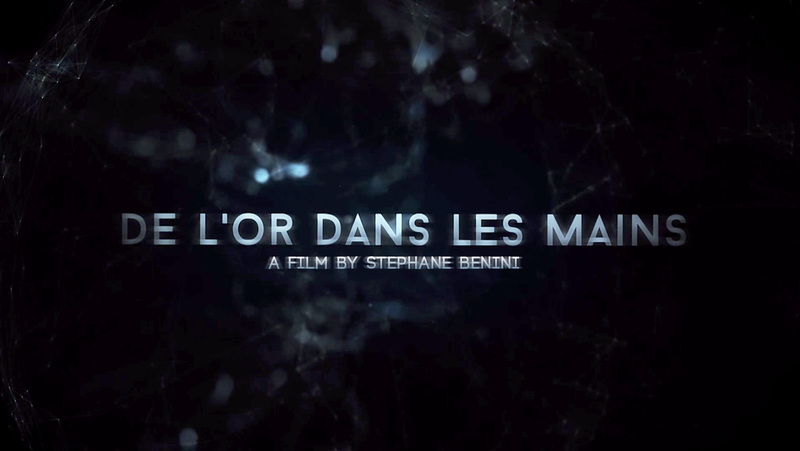 With that said, I was recently contacted through Twitter by a freelance film director from France named Stephane Benini, who simply sent me a link of his work and told me to check it out. Needless to say I was blown away by it. Just the intro of his film “De l’Or dans les mains” or “Hands of Gold” (roughly translated) captivated me. The entire film is a look behind the scenes into the world of Muay Thai and Kickboxing. Filmed in Luxembourg and Thailand, Stephane captures the life and emotions of the fighters, fans, coaches, promoters, photographers, etc. in the moments leading up to the fight, during the fight, and after the fight. The video beautifully captures all of these emotions without the need for dialogue. It’s a musical documentary and experimental film of sorts in the same line as Ron Fricke’s Koyaanisqatsi, Chronos, and Samsara. The funny thing is I have never met Stephane Benini or even spoken to him at length. But I just loved watching how he beautifully captured a sport that is so important to me. And I think that if you are truly passionate about Muay Thai and Kickboxing, you will be as inspired by his film as I was. The Striking Corner Podcast will make it’s triumphant return on Tuesday Dec. 22nd. It has been a little over 4 months since our last podcast and although we never intended to halt production. Juggling the birth of my new son, heavy demands at work, a tediously long commute, and some nagging health issues caused me to halt production and tell Vinny we would nee to put the podcast on hiatus. After all, family and health come first and I needed to focus on those issues first so that I could later give the podcast and website the 100% attention it deserves. If you know anything about me, when it comes to design, multimedia, etc…I am a perfectionist. 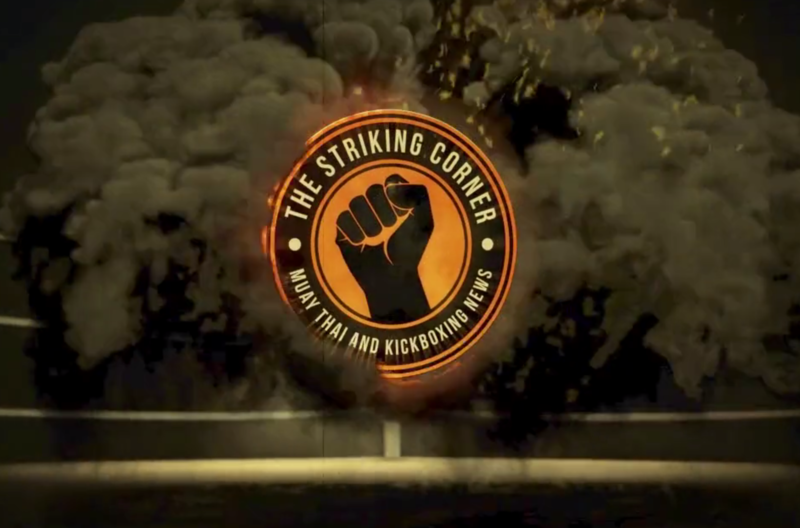 I want The Striking Corner to be the best looking website and the most professional sounding podcast. So I dedicate a lot of time to aesthetics. However, what I realize is that spending so much time on the aesthetics of the site and balancing my work at The Striking Corner with a full time job and a growing family has made our content suffer. There are so many sites dedicated to Muay Thai and Kickboxing lately that do very well of keeping fervent Muay Thai fans informed of all the upcoming events, fights, news, etc…and I want The Striking Corner to be just as good at providing news and information as it is pleasant to look at and listen to. So that is my goal for 2016. We will basically be making a call to all our photographer friends, writing friends, and passionate Muay Thai friends for help with keeping the content flowing at The Striking Corner website. Vinny and I will take care of the podcast but we have definitely arrived at a point where we need help with writing articles and covering events i.e. pictures, recaps, etc. So with all that said, our podcast returns on Tues. Dec. 22nd, we will then take a break for the holidays and will be back in full on Jan. 5th! I’m working on a few new things to make the podcast sound better than ever so stay tuned. The video above is just a start and features just some of the new audio imaging for our podcast. We just want to make it sound better than ever and also aim to have the best guests on the show EVER! Stay tuned and thank you for all of your support. Happy Holidays! I had the chance to speak with Sean Fagan on the Muay Thai Guy podcast recently about MY journey through Muay Thai and how The Striking Corner evolved into what it is today. 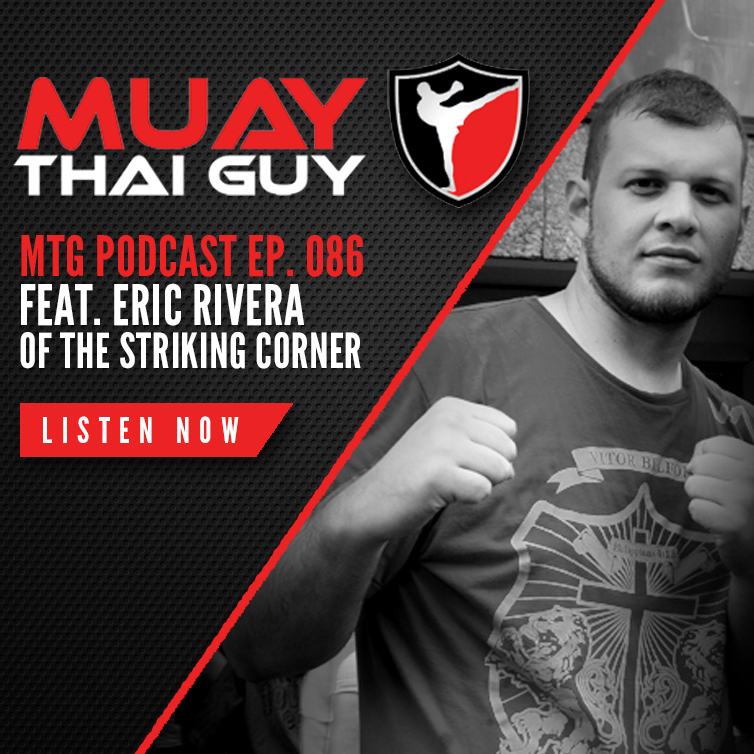 Sean is a great guy who has always been very supportive of what we do here at The Striking Corner so it was an honor to be on his podcast and just talk about our love for Muay Thai, the current state of the sports of Muay Thai and Kickboxing in the US and so much more. I was the person being interviewed for a change…and I have to say that it isn’t that easy to be the one answering the questions. Listen, enjoy, comment, share! Check out the episode here by clicking below! Author’s Note: I wrote this piece after one of my trips to Bangkok. It was written just a few hours before heading to the airport to come back to the states. This particular experience was unique because unlike my other trips to Bangkok, I would not be staying in a Muay Thai camp and their usually very minimal and for lack of a better word, spartan accommodations. During this trip I actually had the privilege to stay at the very luxurious and legendary Oriental Hotel in Bangkok. The company I was doing some work for at the time put me up at this breathtaking hotel with all expenses paid so the experience was needless to say very different than my previous trips to Thailand. It’s about 8 pm, I’m sitting at my hotel room desk contemplating what I am going to do tonight, this being my final night in Bangkok. Once again, I took the 3 leg, almost 30 hour journey from Miami to Dallas, Dallas to Tokyo, and Tokyo to Bangkok. Once again I arrived to the sweltering heat of this Kingdom that feels like home, and once again I was bewitched, enchanted, and awestruck by this mysteriously intoxicating city. 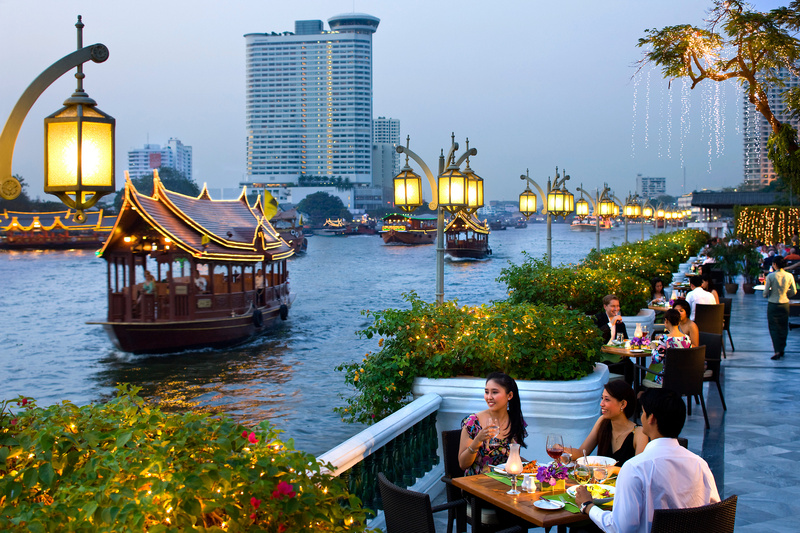 As I write these words I’m sitting at a finely crafted wooden desk in my very chic and expensive room at one of Southeast Asia’s most celebrated colonial era hotels, The Oriental – Bangkok. Room service seems to be active 24/7. With absolutely dedicated customer service that borders on overkill, it seems as if every time I leave my room, even if only to have a quick breakfast or lunch, room service sneaks into my room to tidy up. I have a bottle of Veuve Clicquot Yellow Label Brut Champagne -given to me upon my arrival, and for which I haven’t found the time nor occasion to drink- put on ice daily and again neatly placed into its sterling silver bucket. Pants, shorts, and shirts that had been strewn throughout my room just moments ago, are once again neatly folded or hung in the closet. I am currently snacking on two fruit cocktail shooters made from Thailand’s freshest local fruit, evidently the five star hotels’ idea of the appropriate turn down service treat, which I have to say is much better than those silver and green wrapped chocolate mints given in most hotels stateside. Yes, I’m definitely not going to complain, this luxury is pretty much undeserved. However,…I will take it. However, even with all this luxury, my mind is just consumed by the sadness that in just a few hours I am leaving once again. The 30 hour trip halfway around the world to get here seems like it was just yesterday and once again here I am getting ready to go “home”. The view of Bangkok from my 14th story hotel window only serves as further torture at this moment. The lights of the city below and the moonlight reflecting off the Chao Praya are beckoning me, begging me to stay. Or is it me begging? Yes, it’s probably me. This is Thailand. It is home. It feels more like home to me now than my real home. Every time I am back home, I am longing to go “home”. Bangkok consumes my thoughts, its klongs and sois the subject of every dream. I re-walk the streets of the city, taking in the smell of the various food stalls that line each thoroughfare. I long for Yaowarat’s neon lights, the hustle and bustle of its many oversized seafood restaurants with each locale having waiters wearing the restaurants designated color. I sit here writing this, because even though I am here, I already miss it. I know that the saddening hour when I must board the plane that takes me away from here, is rapidly approaching. I fear that if I go out and enjoy myself now, the enjoyment will cause for the hours to pass rapidly and that moment to come sooner. If I stay here, looking at this clock, while staring at the lights of the city I love, time will slow down…hopefully stop. Bangkok is truly intoxicating and habit forming. It’s no less addictive than the Yaa Baa that currently plagues Bangkok’s poorer sectors. I have been here many times before and still can’t seem to get my fix, or feed my hunger. This lovely obsession with Muay Thai brought me here, and now the city and country itself want to keep me here. When I go home, it’s constantly going to call for me. And like a junky looking to score his next high, I’m going to come crawling back, foaming at the mouth. However, right now, the time for talk is over. The lights beckon, the girls call out into the night, and the streets scream for my presence. There is one last dish of Grapow Moo waiting for me, one last bottle of Singha or Beer Chang to quench this thirst, and one…last night in Bangkok to exprience. Not even this room at one of the most luxurious of Southeast Asian colonial era remnants, a tribute to years long since past, is going to keep me from this last night and these last few hours. 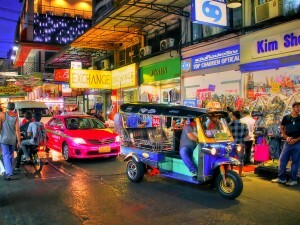 Tonight I get lost in the sweet chaos of Bangkok once again. Don’t wait up.